More than 150 people participated in the Coast to Coast Connector Summit in Winter Garden October 1 and many viewed it as a history-making event. Attendees included elected officials, trail users, local business people and representatives from metropolitan planning organizations, cities, counties, chambers of commerce, and various agencies. It was the first ever forum for those involved in the development and management of the project, prompting a dialogue about consistency and unity along the trail corridor. Common issues and challenges were identified and there was consensus for follow-up meetings to establish and coordinate such things as trail guidelines, safety, signage, amenities and user guides and maps. "This will set the template for trails to come," concluded Florida Greenways and Trails Foundation President Dale Allen. The summit was sponored by the Office of Greenways and Trails, the Florida Greenways and Trails Foundation and the Florida Department of Transportation. Click here to view a new 20-minute video about the Connector, sponsored by the Florida Greenways and Trails Foundation. The Florida Department of Environmental Protection’s Division of Recreation and Parks celebrates designation of the state’s 42nd national recreation trail. This summer the Department of Interior designated the Apalachicola River Blueway as a National Recreational Trail. The National Recreation Trail designation distinguishes trails that link communities and support recreational activities. The Apalachicola River spans 106 miles from the town of Chattahoochee to Apalachicola Bay. The river accounts for up to 35 percent of freshwater flow on the west coast of Florida and is the highest flowing river in the state. The river is also home to a variety of fish and wildlife habitats and is considered a biodiversity hot spot. There are more than 40 camping areas and points-of-interest along the trail. The National Recreation Trail designation was announced in conjunction with 21 additional trails in 11 different states on June 7 in celebration of National Trails Day. The designation raises the profile of the blueway and will likely result in an increase in visitation by Florida residents and visitors and new eco-tourism business ventures. The benefits can be seen through Florida’s Suwannee River WildernessTrail. After trail development began on the Suwannee River in 2004, the annual direct economic impact from the state parks along the Wilderness Trail rose sharply. The Department is participating in a five day paddling trip down the length of the river Oct. 7-11 known as RiverTrek. This is the seventh year of the annual event which celebrates the river and raises funds for conservation. The event will kick off at Clyde Hopkins Park in Chattahoochee and will finish at Apalachicola Riverfront Park. The participants will be greeted along the way by elected officials representing local towns and regions who will speak about the river’s importance and the National Recreation Trail designation. Florida Paddling Trails Association President Tom McLaulin will also be presenting blueway community signs to the river towns of Chattahoochee, Blountstown, Wewahitchka and Apalachicola at RiverTrek events. October is Greenways and Trails Month! October usually marks a change to drier, cooler days in Florida—perfect for getting outdoors! That’s why October is Florida Greenways and Trails Month. The Office of Greenways and Trails, within the Florida Department of Environmental Protection’s Division of Recreation and Parks, welcomes this annual occasion to highlight the variety of local and regional trail activities throughout the state and their health and economic benefits. The month kicked off with the inaugural Coast to Coast Connector (C2C) Summit in Winter Park on October 1. Participants learned about and collaborated on the future of the C2C, an approximately 250-mile connected regional system of local, state and federal multi-use recreational trails. The C2C will connect the Gulf Coast in Pinellas County to the Atlantic Coast near Titusville. If canoeing and kayaking is to your liking, several statewide events are scheduled. The Hidden Coast Paddling Festival in the Steinhatchee area along Florida’s Big Bend Coast kicked off the excitement. From October 2-5, paddlers chose from 23 guided paddling trips, a kayak fishing tournament and a boat cruise on the Steinhatchee River. Plus, there were dinners, lectures and educational events. The Putnam Blueways and Trails group is hosting this year’s Florida Paddlers’ Rendezvous October 16-19. Thirteen exciting trips are planned, mostly along tributaries of the St. Johns River in Putnam County. Paddle Florida features its annual Suwannee River trip October 24-29, and this year, paddlers can also explore two of the Suwannee’s spring-fed tributaries—the Santa Fe and Ichetucknee rivers. Five more events are planned over the next few months, including the Wekiva/St. Johns River Ramble in December, the Florida Keys Challenge in January, the Wild Wonderful Withlacoochee in February, the Dam to the Bay Ochlockonee trip in March and the Suwannee River Paddling Festival in April. For equestrians, the Friends of Lake Louisa State Park's Equine Obstacle Trail Challenge at Lake Louisa State Park will be held October 18 from 7 a.m. to 3 p.m. Riders will be tested on horsemanship and riding skills on 10 different obstacles along 6 miles of the park's beautiful equestrian trails. Bicycling events are highlighted by the 34th Annual Gainesville Cycling Festival and Share the Road Celebration of Cycling October 24-25. Besides free education and information sessions in Gainesville’s historic train station, there will be plenty of fun rides for all skill levels. Cyclovia, Spanish for "cycle path," is a tradition begun in Bogota, Columbia. The idea is to temporarily close off busy city streets to vehicular traffic and convert them to safe environments for biking, walking and community fun. Several Florida cities are taking part and the next one is Cyclovia Tampa Bay on October 19. Kennedy Boulevard will be closed from 9 a.m. to 2 p.m.
And don’t forget the always fun Ride of the Living Dead cycling event on the Cross Florida Greenway October 25. There are two ride options—22 or 50 miles. Dress up in your best Halloween costume for the contest! Florida state parks are offering a variety of local trail-related events, ranging from medicinal plant walks to moonlight paddling trips. Find an event near you! And keep checking the Florida Greenways and Trails Community Calendar for scheduled trail events throughout the year, and the online trail guide for places to go. 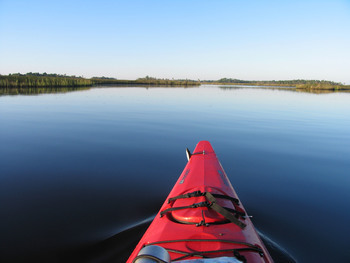 The scenic Steinhatchee River is the latest of Florida’s outstanding waterways to be named a designated state paddling trail. The river’s spring-fed, tea-colored water meanders through a shady corridor of moss-draped trees flanking the river corridor. It widens gradually as it flows through the colorful fishing villages of Steinhatchee and Jena before joining the Gulf of Mexico. The roughly 8-mile designated portion begins just below the historic Steinhatchee Falls, which has been an accessible river crossing for countless travelers through the ages. Native Americans, Spanish explorers and early settlers crossed the shallow limestone shelf that creates the low cascading waterfall and faint traces of wagon ruts can still be seen today. 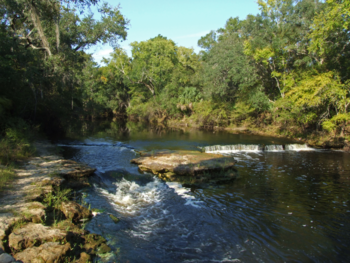 Steinhatchee Falls offers a pleasant picnic area and hand-launch access for small fishing boats, canoes and kayaks. There is also a 3-mile, multi-use trail starting here that can be enjoyed by hikers, off-road cyclists, and those seeking vibrant seasonal wildflowers and wildlife. Fishing from a boat or kayak is an interesting prospect for anglers as both freshwater and saltwater species may be encountered depending upon the stretch of river. Tasty “pan fish” abound in the uppers stretches of the Steinhatchee while saltwater species appear as the river mingles with the Gulf waters. Improved boat ramps on both sides of the river in the towns of Steinhatchee and Jena mark the lower end of the paddling trail and provide good access for all types of boaters. Visitors are urged to bring binoculars and a camera to capture the excellent wildlife viewing along the river corridor and the Gulf coastline. In the fall, colorful monarchs and other butterflies feed upon wildflowers as they migrate southward. Spectacular flocks of white pelicans and other migrating birds are supported by vast tracts of public conservation land that bracket the Steinhatchee River, providing critical habitat for an array of wildlife species inland and along the coastline.